Image caption The former president said he and his wife Laura were grateful to all those working "without a paycheck"
"It's time for leaders on both sides to put politics aside, come together, and end this shutdown," Mr Bush wrote on Instagram. 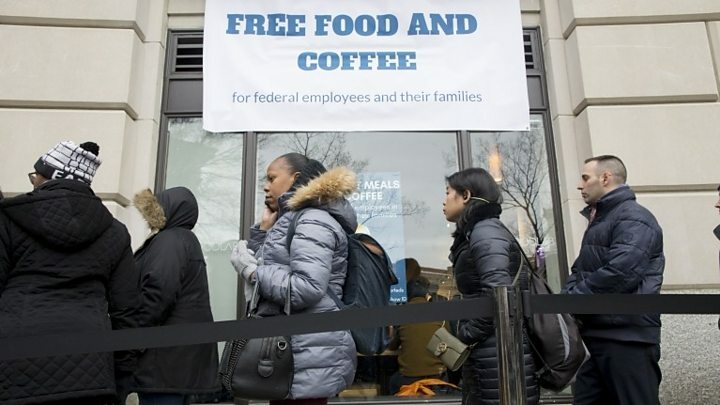 About 800,000 US federal staff are at home or working without pay during the political deadlock over funding for Mr Trump's proposed border wall. 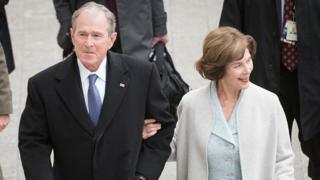 Mr Bush's delivery comes after Speaker of the House Nancy Pelosi asked President Trump to delay the annual State of the Union speech on security grounds. The Secret Service was "hamstrung" by the lack of funding, Ms Pelosi wrote in a letter, arguing he should deliver the speech in writing given the huge security needs for the event. President Trump halted the House Speaker's planned trip to Brussels and Afghanistan two days later, denying her the use of military aircraft. "It would be better if you were in Washington negotiating with me," he wrote. Former President Bush's gesture comes after Canadian air traffic controllers sent their counterparts over the border hundreds of pizzas to help during the shutdown.